Have you been staring at that Christening invitation for a few weeks now, trying to come up with a gorgeous gift idea, for the little baba to treasure forever? Panic over. Whether you are a traditionalist at heart, keen to invest in a bespoke keepsake for the future or just can’t resist a little something that will be perfect for the hear and now, you’ll find a gift that is truly special for celebrating the baptism of the little ones that the whole family can treasure with our Christening Gift Guide. Traditionally silver gifts were given, such as spoons, money boxes and rattles but why not give something that’s personalised a gift that can be kept and cherished. We’re sure there’ll be something here that makes for an ideal Christening gift for the little baba and their family. Our Sterling Silver Cross Collection makes for the perfect traditional gift to celebrate the Christening of a little one, after all what’s more authentic as a Christening gift than a cross? The Collection includes a classic Cross Necklace, and also a charm, ring and stud earrings, different styles to suit all preferences. The design and style of the Cross is heavy and organic in feel with a detailed engraved edge. Handmade jewellery, a perfect for a godparent to their goddaughter. Give a gift of thoughtfulness and meaning with one of our personalised pieces of jewellery. 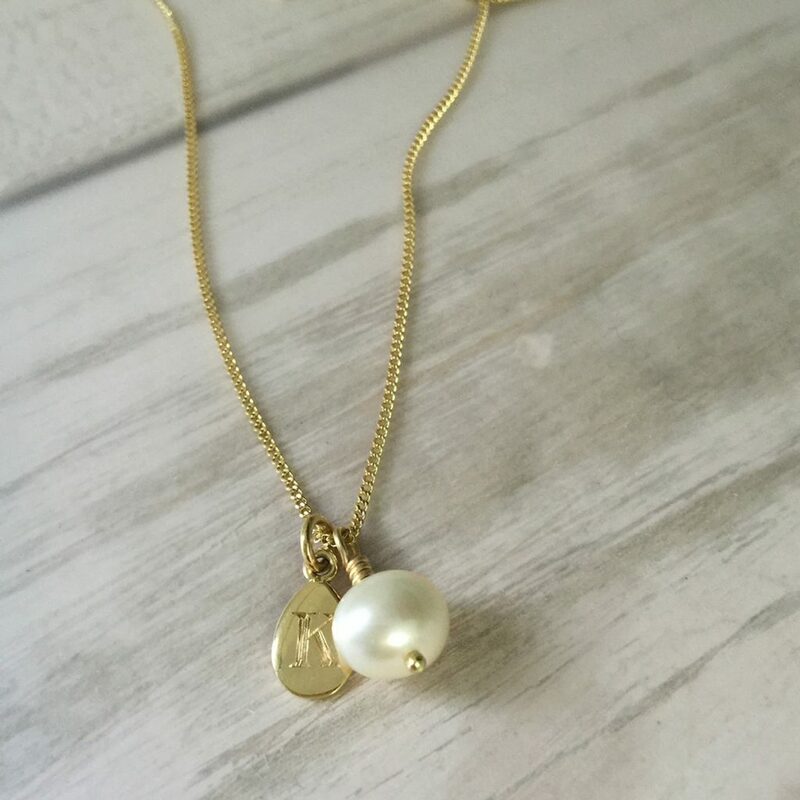 Our Alphabet Letter Charm and Pearl Necklace is hand-stamped on the teardrop disc with the letter of your choice. Mixed with a Freshwater Pearl, known as a teardrop from the moon. The letter you choose to stamp on the charm could be the initial of the little one, or the initial of her parents. Although the necklace may not be worn by the child initially, it can be worn by the mother, so that she can carry her loved one close, until the child is old enough for the necklace to be passed down. A precious keepsake of that commemorates the special day. And if the mother has other children she can add more stamped letter charms to the necklace, personalised to keep all her children close. A classic, timeless design is our Initial Collection, where you may choose to have a disc hand engraved in a scrolled script with initials that carry great meaning. Choose to further personalise this piece by embellishing a precious gemstone in a Victoriana style setting. Read more about the meaning and symbolism behind each month’s precious birthstone on our other blog posts. A firm favourite from the Bianca Jones Jewellery Collection, to be treasured forever, and passed down through the family generations. Christenings are a significant life stage for both the child and parent’s life. To commemorate and mark this special day, these personalised pieces of jewellery are the perfect keepsake gift. Give a gift that can be treasured forever.